According to Conor Foley and DJ Eberle, senior director of player development Kevin Reese confirmed pitching prospects Justus Sheffield and Chance Adams will report to Spring Training as starting pitchers next year. Adams made a spot start for the Yankees last month, but both moved to the bullpen in recent weeks as preparation for their September call-up roles. “I think looking forward, (the bullpen) is something we should try a little bit sooner with guys to give them the ability to kind of learn a routine,” said Reese, while noting lots of big league starters broke in as relievers. Chris Sale, David Price, Max Scherzer … they all initially broke into the show as relievers. Luis Severino did the bullpen thing for a bit too, remember. In Sheffield’s case, he is one of the top pitching prospects in baseball, with the three-pitch mix necessary to start long-term. He has to develop consistent control and command (10.5% walk rate this year), which is nothing unusual for a 22-year-old. Sheffield would’ve been in the big leagues a while ago if he could throw consistent strikes. Let him continue to start and keep working at it, even if it means more time in Triple-A. As for Adams, he had a rough year in Triple-A (4.78 ERA and 4.87 FIP) and there have been doubts about his long-term viability as a starting pitcher dating back to when he made the reliever-to-starter transition three years ago. Of course the Yankees should bring him to camp as a starter. 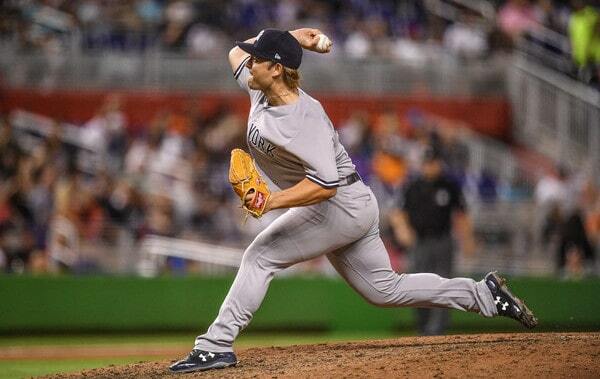 I think the Yankees are much more willing to keep Adams in the bullpen long-term than Sheffield though. There’s no harm in bringing Sheffield and Adams to Spring Training as starters. Same with A.J. Cole, Domingo German, Luis Cessa, Jonathan Loaisiga, and anyone else like that. Bring them to camp ready to start and adjust as necessary. It’s much easier to go starter-to-reliever at the end of camp than the other way around. Sheffield will get plenty of chances to show he can hack it as a starter. Adams might not have the same luxury.